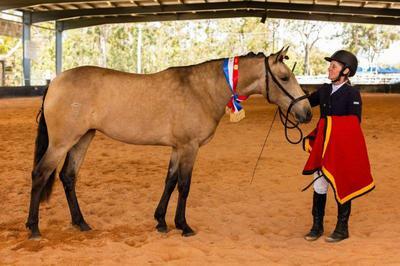 Majestic DeOra has exceeded all expectations and won multiple classes at the 2016 Queensland AHAA State Championships at Caboolture in October 2016. Winning her class, followed by Champion Junior Spanish Female, State Champion Spanish Female and culminating with Supreme Led Andalusian Exhibit - and all before the age of 2yo and at her first show! Beautifully behaved DeOra also won her long-reining and lungeing classes. Additionally Majestic Dorado (DeOra's older brother) was awarded State Champion Spanish Gelding and along with DeOra and the State Champion stallion was contesting the top award. We're delighted with these results and they come on the back of Majestic Emperador being awarded the Victorian 2016 State Champion Led Entire earlier this year.